The discovery of these birds from the Galapagos and Cocos Islands made Charles Darwin famous long before the publication of "On the Origin of Species". A black variety of Galapagos Finch. The Galapagos Islands comprise an archipelago of 13 major and about a hundred smaller islands in the Pacific Ocean, off the coast of South America’s Ecuador. It was a study of the biodiversity of the species of these islands that gave rise to the famous scientific theory of evolution through natural selection by Charles Darwin. On December 27, 1831, Darwin set out on an expedition aboard the HMS Beagle with the ship’s captain and his companion, Robert Fitz Roy, to explore the seas, islands and coasts of South America and record the geological, biological and geographical findings of the journey. When Darwin arrived on the Galapagos Islands, he started collecting specimens from the islands, many of them being birds of different varieties which were sent back to England for further study. On the island, Darwin, not a professional ornithologist by profession, concentrated more on studying the geology of the place and the island invertebrates. After he went back to England, Darwin decided to present his collected specimens of mammals and birds before the Zoological Society. It was then that the expert ornithologist, John Gould, explained that the birds Darwin thought were a collection of black birds, wrens, gros-beaks and finches, were in fact, a collection of a number of species of finches. This fact surprised Darwin and led him to study these birds extensively which gave rise to his world-renowned natural selection theory. The finches thus discovered were then known as “Darwin’s finches”. Darwin’s finches are a collection of 15 different species of finches, all of them belonging to the Passeriformes order and tanager family. Each of these bird species have a different food habit and lifestyle that has led to the evolution of different beak shapes and sizes. The body size of these mostly dull colored birds range between 10 and 20 centimeters, and they weigh around 8 to 38 grams. The warbler finches are the smallest of the Darwin’s finches, while the vegetarian finch is the largest among this group of birds. 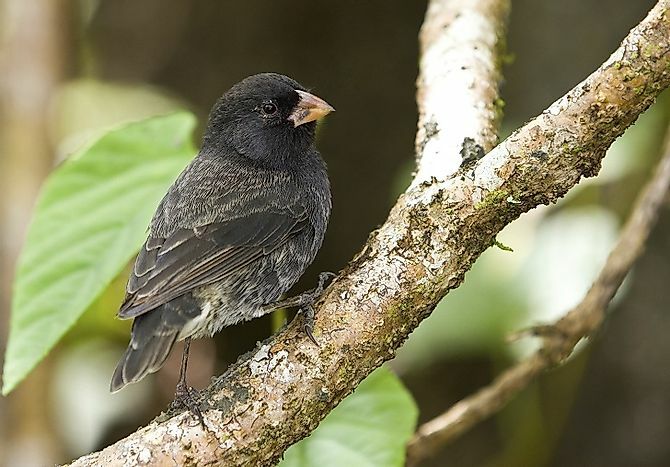 All of Darwin’s finches are native to the Galapagos Islands except for one, the Cocos finch which is found in the nearby Cocos Island in the east Pacific Ocean. The islands experience a warm, tropical climate during the summer months of December to May when the average temperature is around 25° Celsius, days are sunny and rainfall is infrequent but heavy. During the winter months of June to December, the sea temperature is around 22° Celsius and the weather remains foggy with drizzles lasting almost the entire day. The temperature also drops with altitude in the higher elevations. The vegetation of the islands includes lush green tropical forests over large areas and arid and semi-arid vegetation in the lowlands. The Darwin’s finches helped Charles Darwin derive his theories on evolution and natural selection. He proposed that all of the species of the finches on the island of Galapagos were the descendants of a single species that arrived from mainland South and Central America and underwent adaptive radiation into different species. These birds occupied varying niche on the islands, had distinct distinct dietary habits and lifestyles that led to the evolution of different beak patterns and other features of these birds suited to their habitat. Darwin proposed that what happens to the finches happens to all species in nature and this ultimately led to the revolutionary theory of human evolution from the apes that though widely accepted today, created a discrepancy in Darwin’s time. More recent research in 2004 has revealed the gene responsible for the variation in beak morphology of Darwin’s finches to be the bone morphogenetic protein 4 (BMP4). Though the Galapagos Islands is itself affected by climate change and global warming, the finches on the island face an even greater threat from a parasite that is killing their young in large numbers. A species of nest fly lays parasitic larvae in the eggs and nestlings of these birds which grows inside the young ones and attack them, leading to their death. If human intervention does not take place, there is every chance that these birds might disappear within a span of 50 years. Scientists have devised out various plans to eliminate the pests from infecting the birds. One way to do this is by supplying cotton balls sprayed with chemicals for the birds to incorporate in their nests which would eliminate the parasites. The other is the introduction of wasps on the island that would destroy the fly larvae.